Many people learn more than one language in their life. The diversity across languages seems to cause differences in the learnability of additional languages by adults, depending on their language background. This dissertation studies effects of linguistic distance on adult learnability using language testing scores of more than 50,000 adult learners of Dutch. 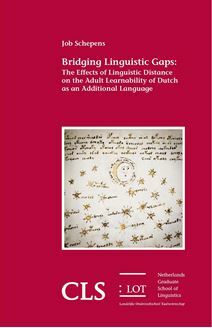 This dissertation shows the systematic effects of linguistic distance on the learnability of Dutch as second and third language in the lexical, morphological, and phonological domains, controlling for other factors relevant in the learning process such as age of acquisition, exposure, gender, and education. The larger the linguistic gaps learners need to bridge, the lower the learnability. The findings are based on an approach that combines language testing scores, language typological databases, and mixed effects regression modeling. A number of new measures of linguistic distance have been developed. The measures show that lexical, morphological, and phonological distance all play autonomous roles in learnability. Therefore, linguistic distance deserves a prominent role in theories of adult language learnability. Linguistic distance can be used to estimate the effort that learners need to put in learning an additional language. This conclusion challenges views that place strong emphasis on the universal nature of second language acquisition.